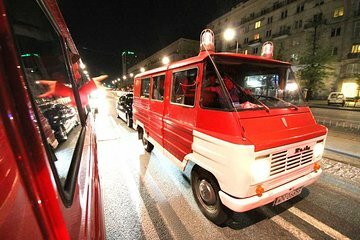 Explore the intersection of Warsaw’s past and present on an evening city tour and pub crawl aboard a Communist-era minibus. Roll through the capital’s liveliest districts with an in-the-know driver and guide, stopping to revel in the hottest nightlife spots alongside locals. It's not all just dancing and drinking though—learn about Warsaw’s tumultuous history and see surviving examples of pre-war artifacts and Communist architecture that dot the urban landscape. Awesome tour with Mark! He showed us some of the more up and coming places in Warsaw, and gave a really interesting history on the city. The tour was supposed to end by 22:30 but we didn't finish until after 23:00. Highly recommended!